I really will get back to the salvation series soon, but this is on my mind today, so I want to post it now. That got me thinking about the church as a puzzle. Each member is “just one of the pieces,” and God is the maker and assembler. I don’t know if that’s exactly the meaning intended by the singers, but it does bring about some interesting observations. Puzzle pieces do not get to choose where they are placed. They simply go where the assembler puts them. Puzzle pieces are only responsible for connecting with the few others placed directly around them. Puzzle pieces cannot see the big picture from their perspective. They must trust the assembler to place them properly. Should a puzzle piece try to correct another section of the puzzle, it would have to leave its own proper place to do so. 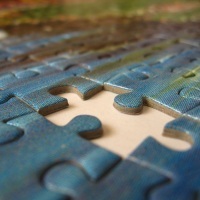 A single piece out of place makes the puzzle incomplete. That’s all I have for now. Here’s an acoustic version of the song that inspired this.